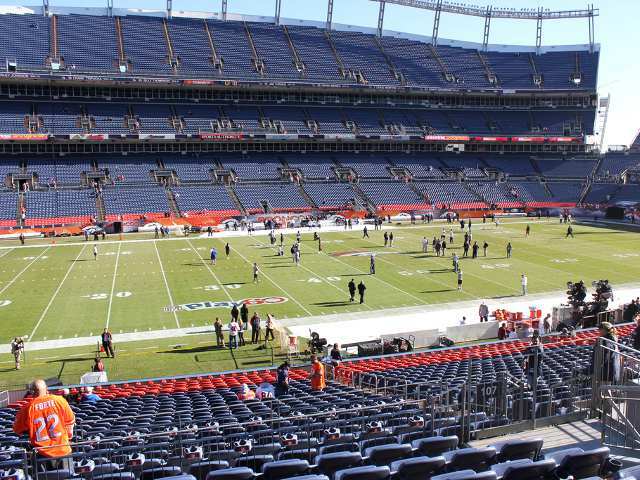 The Denver Broncos Field Level Between Goal Lines makes up the majority of lower level seats between the goal lines at Sports Authority Field at Mile High. The Sports Authority Field at Mile High seating chart shows the Broncos Field Level Between the Goal Lines seats in portions of 14 different sections on the first level of stadium seating. Denver Broncos Field Level Between Goal Lines seats make up all of eight sections and part of six sections. On the Broncos (west) sideline, Field Level Between Goal Lines seats occupy all of section 102, section 103, section 107, and section 108. The seating area also includes the back half of section 104, section 105, and section 106. On the visitor’s (east) sideline, Field Level Between Goal Lines seats take up all of section 120, section 121, section 125, and section 126. They also make up the back half of section 122, section 123, and section 124. All Field Level Between Goal Lines seats offer a great view of the field from the second-best seating area on the ground level. Only the more expensive Field Level Prime tickets offer a better view of an NFL game. The best Field Level Between Goal Lines seats are in the front rows of the three sections closest to the 50-yard line on each side of the field. Broncos Field Level Between Goal Lines tickets are sold primarily as full season tickets to long-time Broncos season-ticket holders. As there is a long waiting list for Broncos season tickets, there are few unsold tickets in the seating area following the conclusion of season ticket sales. Any scattered remaining seats are offered to fans as individual game tickets. The price of Denver Broncos tickets changes each year, but the Field Level Between Goal Lines tickets are always cheaper than tickets in the neighboring Field Level Prime sections.